Polymer clay baked on glass is a really exciting technique for children and adults. 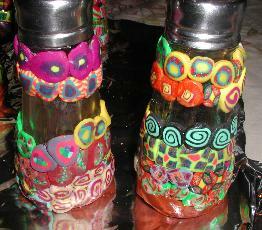 Many glass objects can be covered with polymer clay and then baked in the oven. 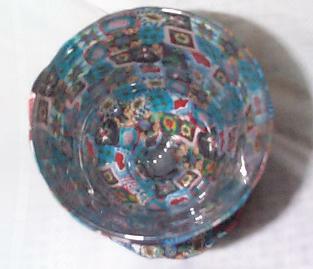 Many are for both decorative and useful items. I have baked Sculpey, Friendly Clay and other Polymer Clay onto a variety of glass objects. My friends and students have really enjoyed them. 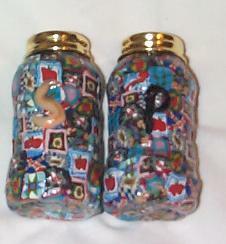 Some objects that can be used are candlesticks, salt and pepper shakers, baby food jars, ash trays to name just a few. I use thick glass but you may want to carefully experiment with others. For many years our favorite camp crafts have been made from clay. First Salt Clay for home made clay we could make into large objects. Then we discovered Sculpey Polymer Clay! The world of adult looking camp crafts began. Eileen's Craft Pictures and Instructions. 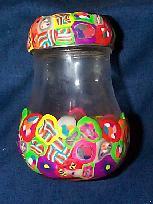 Some more of Eileen's Clay on Glass projects are included on my Baby Food Jar Crafts. 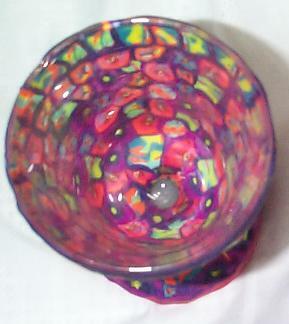 Inside view of Kiddish Cups. Any holiday event where a decorative wine glass is needed. 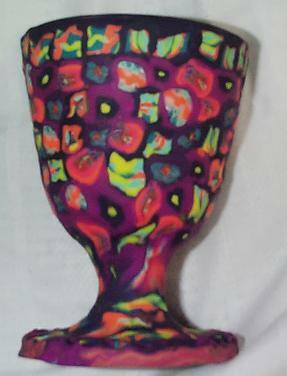 See Passover Page for more information and about these goblets. Please remember that polymer clay is not play dough and needs adult supervision. Basic Directions/Tips For Baking Polymer Clay On Glass. 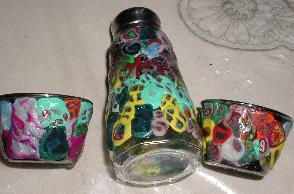 See Eileen's Clay Page for basic polymer clay lessons and ideas. My favorite technique is using cane slices. Clay rolls/squares can be made by many groups. 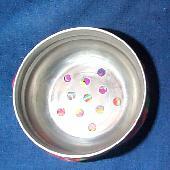 The teacher then thinly slices them and gives each group or class an assortment. See manufactures suggestions for how thin to slice them. I often slice them 1/4 inch then. I slice them onto sheets of wax paper and then layer sheets inside a covered plastic container. The slices can be used even weeks or months later. When time to share, I take out sheets carefully and place on metal cookie sheets to pass around to students. Students transfer the slices they want onto wax paper they have placed on a foam plate. They then can safely carry back the slices to their table. With little children, I walk around with trays, have them pick their slices and then put them on to their wax paper for them. I also make rules on when they can carefully apply them to their object. Sometimes having younger children wait for teacher or aide to help place them. This cuts down on the children squishing the tiles/slices too flat. I like using multiple canes especially with children but many great and beautiful projects can be made with all of the slices are the same pattern. Many times I allow the children to take a limited amount of slices at a time. This helps prevent them taking too many for their project and protects the slices from abuse. Slices should be placed next to each other and touching with no empty spaces. When finished covering, roll gently in your hands to smooth the clay and to allow for even thickness. When applying clay to something with a cover make sure to try your cover on before baking. Trim the clay neatly at top to allow the cover to fit back on. Sometimes as in the case of Baby Food Jar Projects, I also cover the cover with clay for a more finished look. So make sure to try on the cover and trim that too if needed. I like to bake all projects on a pryrex container covered with parchment paper. This keeps dust, dirt or other substances from touching the clay from other projects. Do not forget as with all clay or craft projects to mark the child's name somewhere on the project. They often do not recognize their finish art work! Also if you also mark the year, parents love to remember how old their child was when they made this treasure. I use a pointed object or tooth pick to lightly scratch name and date. If baking multiple classes in one day. I mark on parchment paper which class I am baking this helps when it is time to wrap to send home. Sales from that site helps pay for the expenses of my free educational lessons and web pages. But as there are so many people out there asking for directions for these crafts, I am including some of them here for you to see. Hopefully these pictures will inspire you to make your own polymer clay on glass projects. Clay canes on just part of a glass salt and pepper shaker. Gold powder with satin gloss. I taught this lesson to a class of 3 and 4 year olds. 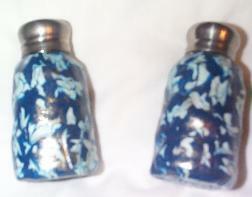 We made the salt and pepper shakers like below with modification. I had them leave some of the glass uncovered. One because I like the look and two because I wanted to be able to see if it was salt or pepper. This also saves money because of less clay but also saves having to make snakes and teacher making a lot of S's and P's. I had them play with the terra cotta sculpey sold in 1 3/4 pound boxes. Economical and nice color for bottom. I had soften the clay then rolled through the pasta machine. They love playing with the pasta machine. I covered the bottom with their sheets then carved with a pointy tool their initials for later identification. At this point I have them wash their hands or use hand wipes to take off the terra cotta color from their hands. I passed out small amounts of regular sculpey. About 1 oz or less. There hands get tired easy. They put it through the pasta machine and then I made jelly rolls. I use a safe cutter around children. Sliced canes and distributed them. They were told to leave the center open and to press gently. Many tried to cover the whole thing. Luckily I had some canes left from and older class so we passed out more slices. I have a helper when teaching this class. Usually 10 to 12 children at a time. This same technique could be used to make a salt shakker into a Jewish Spice box/bottle called a Havadallah spice box. 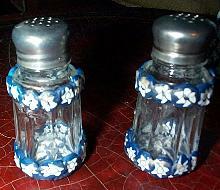 These salt and peppers use slices from many canes made from Sculpey. Scraps of clay are Rolled into a snake and shaped into an S or P.
These salt and pepper shakers are made from Friendly Clay Company pre-made cane squares. They are sold in many stores. I have reduced them to a smaller cane. Because this is Friendly Clay, which I find can crumble, I use their special microwave warmer to warm the canes before I reduce and/or slice. These warmers are difficult to find for some reason but are really helpful. You warm a heat pack and then place that into a cloth bag that comes with it. You then place canes in bag and wait. This really helps this product slice smoothly. 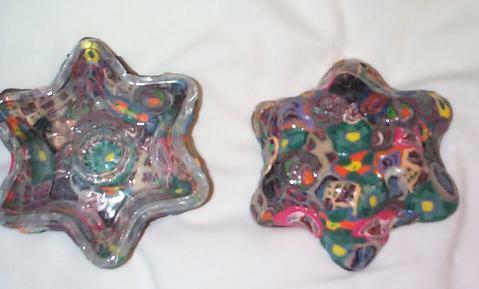 I have made many star candle sticks. I like to place the clay on the bottom of a transparent clear candle stick. 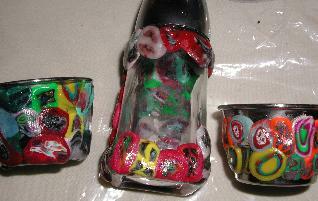 This shows the colors but the dripping candle wax can not stick to clay. 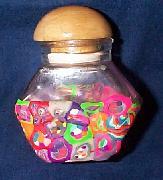 Clay On Glass Bottle with Metal Cover. 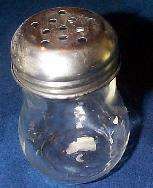 Great for Salt, Havdallah Spices, Sugar shaker etc. I covered most of the holes and made others smaller as I only needed small holes to let the smell out for Havdallah spices. I also only covered part of the bottle to allow a view of the contents and to show a different technique. Many people cover only a part of a glass object. To make the above project easier for me to teach to preschool children, I cut a few steps. I gave each student about 1/2 oz of two colors. We had them play with the clay to soften and then rolled out using a copper tube I have in large quanities. We stretched to make the two colors about the same size and placed one on top of the other. Rolling into a "jelly roll" cane. The children rolled them out thinner into a snake like shape about 1/2" wide and teachers rolled them thinner. We cut the canes using the clay safe cutter that is a half moon shape. This is safer to use and leave around young children. Starting from the bottom they carefully places canes next to each other and up the sides. The teachers rolled them thinner. The baking and coating directions same as other projects. Clay on glass and metal. 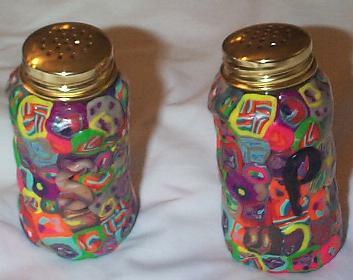 One salt or pepper shaker and two mini stainless steel sauce cups are the bases for this mini havdallah set. One sauce cup for the wine/kiddush cup and one to hold the havdallah candle. These sets were also made in a preschool class. I did gloss them as in Havdallah you don't drink the wine only use it to put out the flame of the candle so it did not have to be made food safe. The glass of the salt or pepper shaker can be covered with canes totally including bottom or just along the bottom and rim so children can see the spices inside. A found the salt shakers for these at The Dollar Tree Store. The sauce cups were in a set of 4 for $1.00! 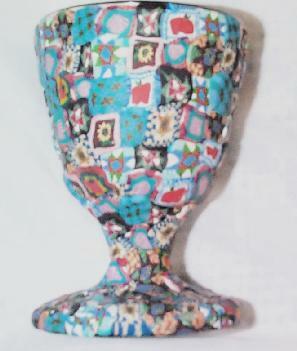 Clay On Glass Bottle With Wood Cover. I resisted covering the wooden cover! I liked the wood plus it had a rubber seal that looked like it might not survive my taking it off and on. The seal would be important if I used it for spices. You can cover all or part of the glass. Eileen's Clay On Paper Mache. 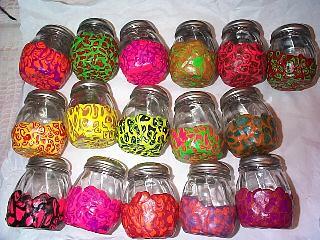 and on Eileen's Baby Food Jar Projects. I found some glass bottles/jars with metal lids that are sugar jars. I covered it with blue and white canes of Sculpey, that as I rolled with my warm hands turned to blue, white and light blue. This was meant to pour sugar. I am always looking for new uses for things. so I think it can also be used for Havdallah spices, because of the star shape holes in the metal top. Canes cane be made perfectly but I often like the imperfect or surprise canes. These are the slices you get at the end of a cane after reducing the cane from a large cane. They are often more interesting then the planned cane slices. Same cane slices on glass salt and peppers. Sealed with a satin Sculpey glaze that had some gold metallic powder mixed in.